Mostly the primary domain change of your Store is used when you would like to deploy a staging version of your website on the live environment or if you have decided that you will need a new domain name to represent your online business. In the next few lines of this tutorial we will provide detailed information on the whole process of changing your currently used domain to another one. Before performing any large change on your Online Store you will need to of course activate the maintenance mode. If you are not familiar with the process you can follow our other tutorial for how to activate the maintenance mode in PrestaShop 1.6? Now that your Store is down for maintenance and no orders can be placed it is time to actually change the domain name. The scenario will be the following – you will be accessing the admin area with the old domain name just before you change it to a completely new one. Once when you access the admin area of your website you will need to access the Preferences>SEO & URLs page as there is the exact place where the domain can be changed. 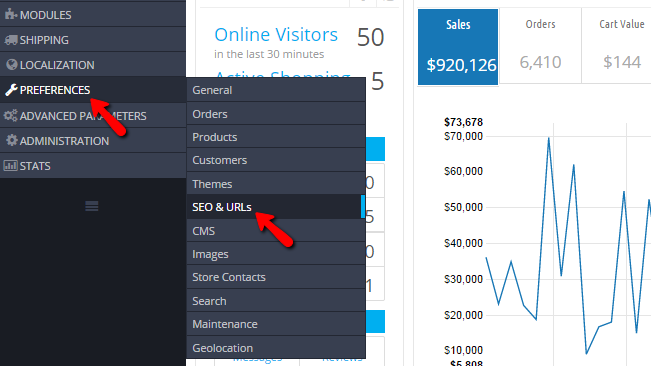 Once there you will need to scroll a bit down on the page skipping the whole SEO & URLS section and moving forward to the SET SHOP URL section where the actual domain for your store is stored. You will notice how the fields will be already filled with the current domain name your store is using. Please change that to the new domain name by updating the Shop domain and SSL domain fields with the new domain name your Store will be using. If you need to change the subfolder along with your domain you will also need to update the Base URL field with the name of the folder. Once you are done with the changes please click on the Save button so the new domain can be saved into the database. Keep in mind that right after this change your admin dashboard might become unavailable until you associate the new domain with your web hosting account. Congratulations! You can now change the domain your Online Store is accessible at!